An unbiased and a comprehensive report, titled “Arthroscopic Shaver Market: Global Industry Analysis (2012-2016) and Forecast (2017-2026)”, has been recently published by Persistence Market Research (PMR). The report analyzes the global arthroscopic shaver market in detail, covering key market dynamics exhaustively. The report provides information about trends, restraining factors, and propelling factors that impact expansion of the market. The report also offers analysis on data across multiple parameters to achieve significant numbers pertaining to the global arthroscopic shaver market. An in-depth study on the market’s competitive landscape is delivered in this report, which includes information about proactive industries operating in global arthroscopic shaver market. The report begins with a chapter that provides an executive summary of the global market for arthroscopic shaver. This chapter delivers a synopsis of arthroscopic shaver market at a global scale, and delivers relevant market numbers that include the historical CAGR during 2012 to 2016, and the forecast CAGR during 2017 to 2026. In terms of highest CAGR and largest revenue share, the report provides information about lucrative regions for the global arthroscopic shaver market’s expansion. Following the executive summary, a chapter providing overview of the global arthroscopic shaver market has been delivered in the report. This chapter includes a formal definition of “arthroscopic shaver”, and a brief introduction of the global arthroscopic shaver market. The overview offers a clear perception of global arthroscopic shaver market’s wide scope to the report readers. Following chapters shed light on important dynamics of the global arthroscopic shaver market, covering key points such as the fiscal stimulus, the global economy, and bottom line of enterprises. Succeeding chapters of the report deliver information about the market’s pricing analysis and cost structure analysis. The report has offered a segmentation analysis of the global arthroscopic shaver market. The report categorizes the market in terms of five key segments viz. product type, application, end-user, and region. Market share comparison, coupled with the revenue and Y-o-Y growth comparison are used in the report for providing insights about the market numbers associated with the segmentation analysis. Global market for arthroscopic shaver has been divided into six key regions, which are Japan, Middle East & Africa (MEA), North America, Europe, Asia-Pacific excluding Japan (APEJ), and Latin America. The report has portrayed presence of the market players with the help of an intensity map. The concluding chapter of the report offers analysis on the global arthroscopic shaver market’s competition landscape, profiling key market players in detail. Insights on the market players is offered in terms of SWOT analysis, which analyzes the strengths, weaknesses, opportunities and threats pertaining to the particular company. The information provided in this chapter also comprises the key developments, company overview, key financials, and product overview of the companies. The chapter on the competition landscape is referred as the most crucial part of the report for readers, as it offers all necessary information about companies, along with their strategies that help them in staying at the market’s forefront. A comprehensive research methodology has been adhered to by PMR’s analysts while developing this report, to deliver forecasts and insights on the global arthroscopic shaver market. The research methodology adopted completely relies upon the primary and secondary research, which has helped in gaining necessary information about the global arthroscopic shaver market. The information gathered has then been validated several times by the analysts, for making it an authoritative and authentic reference source for clients. Arthroscopic shavers are powered systems that are designed for sift tissue and bone resection during arthroscopic joint surgery procedures. Arthroscopic shavers basically comprise an electric/pneumatic power supply unit, dedicated software that offers optimal parameters required for respective procedures and stores previous settings, and display of operational characteristics. Rapid development has been witnessed in arthroscopic procedures, along with the sophistication of instrumentation over the past few years. Powered instruments, such as an arthroscopic shaver, are generally used in all kinds of arthroscopic procedures. Arthroscopic shavers have become an imperative equipment in routine arthroscopic work, for improving visualization as well as for therapeutics. Surgeons are now inclining their preferences from traditional arthroscopic shavers that were reprocessed & reused toward adoption of single-use arthroscopic shavers. This is mainly because of physical damage caused to shaver blades during its use, and to prevent potential risk of infection caused by reuse. The development of arthroscopic shavers has resulted into versatility of the arthroscopic surgery, enabling controlled management of bone and soft tissue resections as a part of the reconstructive arthroscopic procedures. However, remnants of debris within the spaces between joints after the arthroscopic shaving process have been noted to cause post-operative symptoms owing to mechanical interference or inflammatory reaction with joint function. Persistence Market Research (PMR) has projected a steady rise for the global arthroscopic shaver market in its recent report, for the forecast period (2017-2026). Global sales of arthroscopic shaver are estimated to surpass revenues worth US$ 600 Mn by 2026-end. In terms of revenues, Europe will continue to be the most lucrative market for arthroscopic shaver, with sales estimated to reach nearly US$ 200 Mn by 2026-end. However, the market in Europe will register a relatively lower CAGR than all the other regional segments except Japan through 2026. Japan is projected to reflect the lowest CAGR in the market through 2026. North America, and Latin America will also remain lucrative regions for growth of the arthroscopic shaver market. Based on product type, shaver handpieces are expected to account for the largest revenue share of the market during 2017 to 2026. Introduction of new high torque & lightweight designs in shaver handpieces are helping surgeons to maintain their performance & speed, and prevent stalling. Sales of shaver handpieces are projected to witness the fastest expansion through 2026. Orthopedic clinics are anticipated to be the fastest growing end-users of arthroscopic shavers by 2026-end. However, revenues from arthroscopic shavers’ sales in orthopedic clinics will remain relatively lower than those from hospitals and ambulatory surgical centers. In addition, revenues from ambulatory surgical centers will remain relatively lower than those from hospitals in the global arthroscopic shaver market. Knee repair and hip repair will continue to be the largest application of arthroscopic shavers. Revenues from these two application segments are collectively estimated to surpass US$ 500 Mn by 2026-end. However, sales of arthroscopic shavers in hip repair procedures will exhibit a comparatively higher CAGR than that in knee repair procedures. 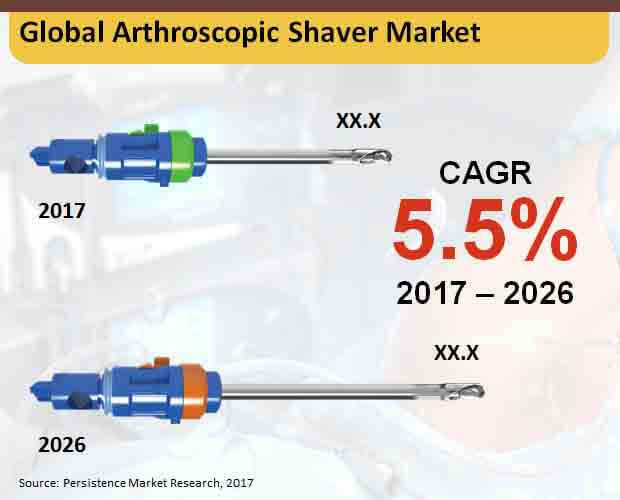 Sales of arthroscopic shavers for application in shoulder repair will account for the lowest revenue share of the market throughout the forecast period. Competition in the global arthroscopic shaver market is likely to intensify on the back of increasing M&A activities between established players and regional vendors, along with the rise in technological innovations. In addition, regional and local vendors are focusing on providing application-specific products. PMR’s report has identified key players in the global arthroscopic shaver market, which include Karl Storz GmbH, Arthrex, Inc., CONMED Corporation, Stryker Corporation, Smith & Nephew, DePuy Synthes Mitek Sports Medicine, and Zimmer Biomet.